A run for the highs continues. Risks very much outweigh rewards at this juncture and there is no real victory to be had by chasing markets currently. Before sticking your head in the sand and ignoring market risk based on an article touting "long-term investing always wins," there is a huge difference between just making money and actually reaching your financial goals. "Fueling the markets are statements from past and present Fed Governors that are not only dovish but discuss a resumption of QE and negative interest rates. Former Fed Chairman, Janet Yellen, recently said the Fed needs more tools to battle a financial crisis. This is the same Janet Yellen that, in June of 2017, stated that she did not believe we would have a financial crisis in our lifetimes. "The markets are close to registering a 'golden cross.' This is some of that technical 'voodoo' where the 50-day moving average (dma) crosses above the longer-term 200-dma. This 'cross' provides substantial support for stocks at that level and limits downside risk to some degree in the short term." "S&P Logs Longest Win Streak In 18-Months After Strong Jobs Report." If this is the longest "win streak" in 18 months, that should tell you we are likely near the end of the run and not the beginning. That doesn't mean the markets are going to crash, but a short-term correction is likely to provide a better risk-reward entry point. The employment report wasn't why the market rallied on Friday. 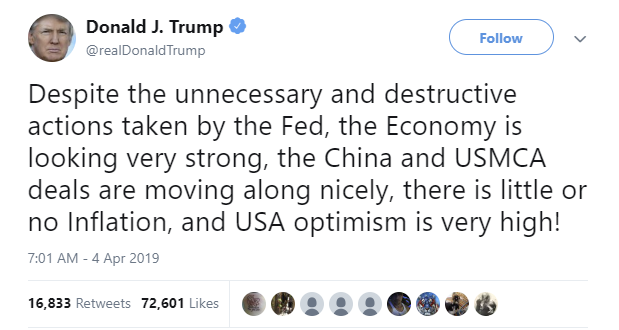 In actuality, it was Trump's comments about "trade," the Fed needing lower rates, and the nomination of Herman Cain, another Trump supporter along with Stephen Moore, to the Federal Reserve Board. "China would commit by 2025 to buy more U.S. commodities, including soybeans and energy products, and allow 100 percent foreign ownership for U.S. companies operating in China as a binding pledge that can trigger retaliation from the U.S. if left unfulfilled." If this turns out to be the case, President Trump may claim a victory for resolving a dispute he started in the first place, but the markets will likely quickly see through the fiasco. "'Politics' is increasingly on a collision course with Central Banks… and that may be become the 'new' most important driver of world markets. On July 7/18 I wrote: Politics has replaced Central Banks as the most important driver of world markets according to Christopher Wood, financial analyst with CLSA, and I agree. It seems that for the last several years it was, 'All about the Central Banks,' but since Trump's election, the markets have been buffeted at least as much by political developments as by Central Bank actions. The recent Italian 'existential crisis' is a fine example of politics rattling the markets. Is this really a Republican President effectively calling for the Fed to begin monetizing government deficits? We've come a long way from Fed Chair William Martin declaring that it was the Fed's job 'to take away the punch bowl just as the party gets going.'" Importantly, and as we will discuss in more detail momentarily, lowering interest rates and introducing QE are tools the Fed will use when real weakness shows up in the economy. While Trump may want further "emergency measures," he isn't arguing the "need" for those measures very well. "Could we be done with policy rate increases this cycle? It is possible, but if the economy performs along the lines I think is the most likely case… the fed-funds rate may need to move a bit higher than current levels." "I continue to be in 'wait-and-see mode' with expectations of at most, one hike for 2019 and one for 2020." Those comments don't align with a Fed eager to sit on the sidelines, reduce rates, or begin to inject further stimulus. Furthermore, Fed officials think the economy is in a good place with low unemployment and benign inflation. If they sense a slowdown, Fed officials would first act by trimming their benchmark interest rate. In other words, the Fed is already factoring in a scenario in which a shock to the economy leads to additional QE of either $2 trillion, or in a worst-case scenario, $4 trillion, effectively doubling the current size of the Fed's balance sheet." "The benchmark S+P 500 Index (my bellwether for global risk appetite) had its best Q1 performance in over 20 years and is now only a few percentage points away from All-Time-Highs. Monetary conditions are easy, FOMO and TINA are the key words while DeMark technical indicators and sentiment measures are at extremes. Implied Volatility keeps falling as stocks rally…currently at one month lows." He is right. 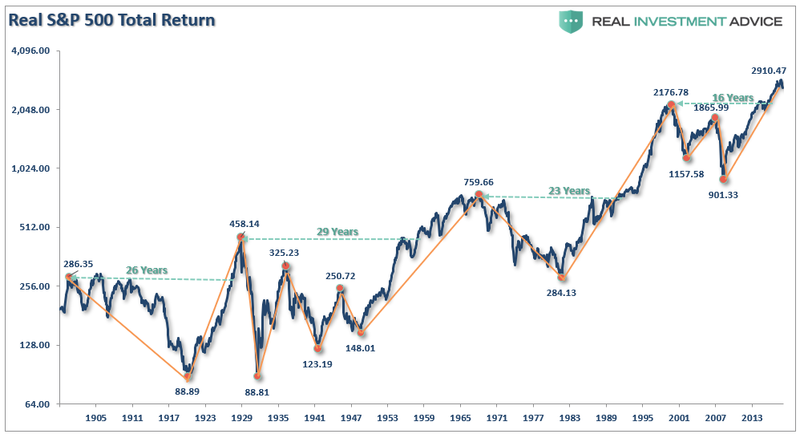 But we are only one-quarter of the way through the year, and while stocks could well reach all-time highs, the potential for a decent correction has been put into place. If you don't know what to do, that is okay. Cash now has a yield equivalent to inflation with no volatility and no risk of loss. What more could you ask for if you aren't letting "greed" dictate your investing? 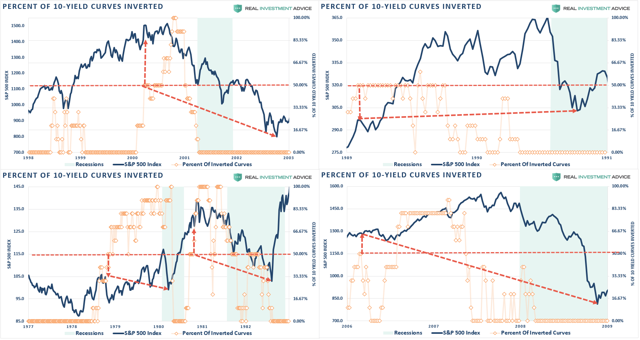 "This quad-panel chart below shows the 4-previous periods where 50% of 10-different yield curves were inverted. I have drawn a horizontal red dashed line from the first point where 50% of the 10-yield curves we track inverted. I have also denoted the point where you should have sold and the subsequent low." 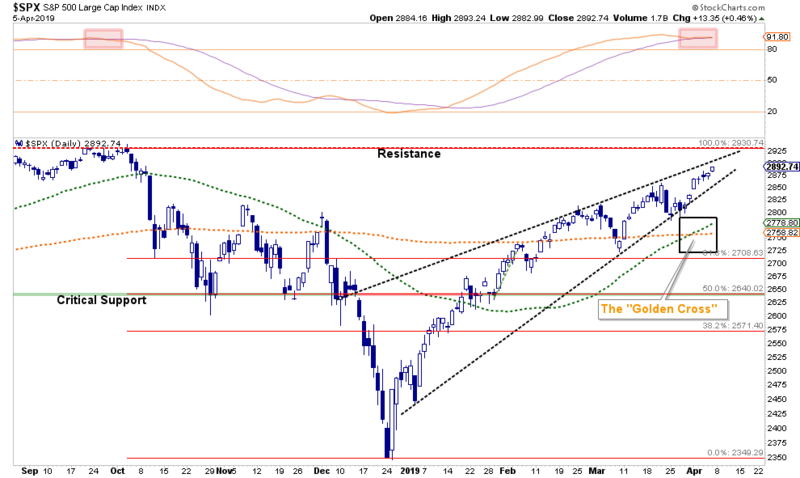 "As you can see, in every case, the market did rally a bit after the initial reversion. However, had you reduced your equity-related risk, not only did you bypass a lot of market volatility (which would have led to investor mistakes anyway) but ended up better off than those trying to just ride it out." "The big move two weeks ago was in bonds. If you have been following our recommendations of adding bonds to portfolios over the last 13 months, this portion of the portfolio has performed well in offsetting market volatility. 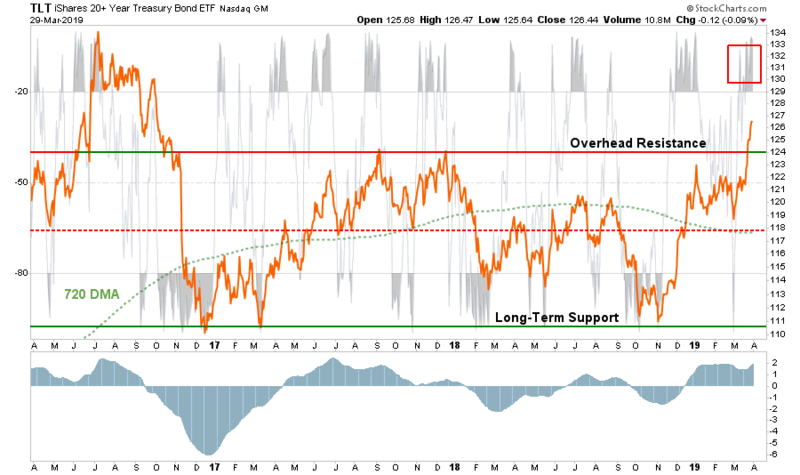 As noted previously, intermediate duration bonds remain on a buy signal after increasing exposure last month. However, they are now extremely overbought, so look for a pullback that holds 2.50% on the 10-year Treasury to increase exposure." However, a TECHNICAL reversion is not the same thing as a statement on the economic recovery. The rotation between bonds and equities this past week does NOT represent a false signal by rates that economic growth is set rebound. As with all things, the trend of the data is far more important than a specific data point and currently the "trend" of yields is lower… not higher. Economic growth outside of China remains weak. There isn't another stimulus package like tax cuts to fuel a boost in corporate earnings. "The only permanent cure of ignorance, is experience." "Sure, a correction will eventually come, but that is just part of the deal." Let's look at the S&P 500 inflation-adjusted total return index in a different manner. 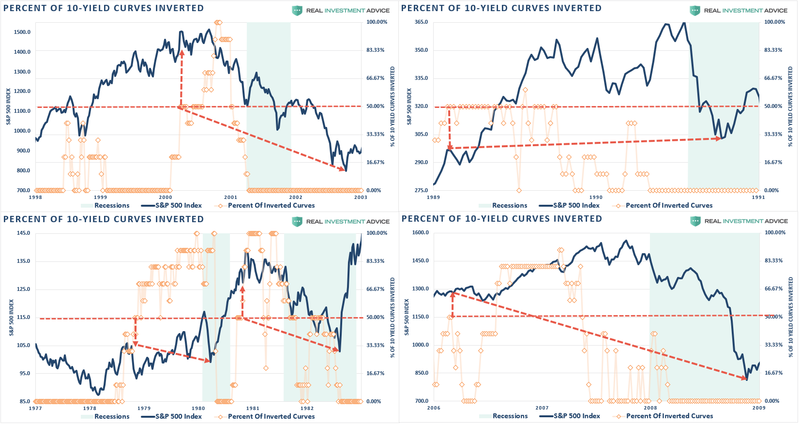 The first chart shows all of the measurement lines for all the previous bull and bear markets with the number of years required to get back to even. 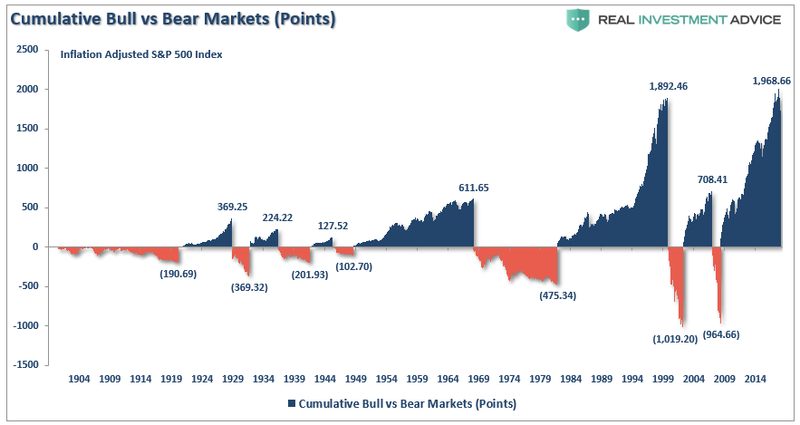 What you should notice is that in many cases, bear markets wiped out essentially a substantial portion, if not all, of the previous bull market advance. This is shown more clearly when we look at a chart of bull and bear markets in terms of points. In other words, a place where today's free lunches are paid for doubly tomorrow. In the light of recent experience, I think the present level of the stock market is an extremely dangerous one." For every "bull market" there MUST be a "bear market." Understanding that investment returns are driven by actual dollar losses, and not percentages, is important in the comprehension of how devastating corrections can be on your financial outcome. So, before sticking your head in the sand and ignoring market risk based on an article touting "long-term investing always wins," there is a huge difference between just making money and actually reaching your financial goals. There are 4 steps to allocation changes based on 25% reduction increments. As noted in the chart above, a 100% allocation level is equal to 60% stocks. I never advocate being 100% out of the market as it is far too difficult to reverse course when the market changes from a negative to a positive trend. Emotions keep us from taking the correct action. As we have discussed so many times in the past, by the time a "buy" or "sell signal" is triggered, because we are working on longer-term indicators, the markets tend to be very overbought or oversold when that signal is registered. Such is the case currently with our confirmed buy signals. 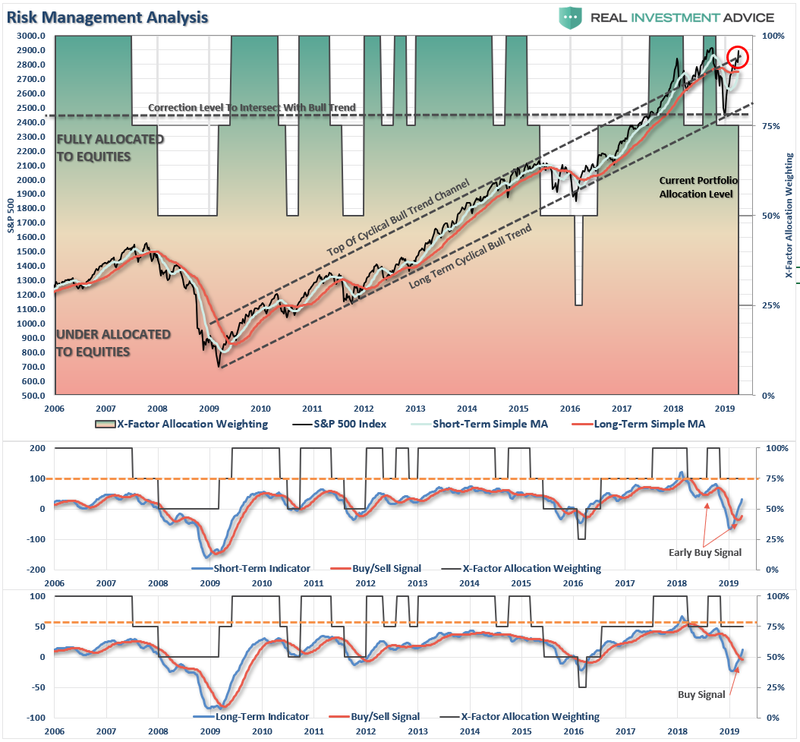 While both "buy" signals are now in place, suggesting that target allocations move to 100% equity exposure, the market is also EXTREMELY overbought on a short-term basis and pushing up against longer-term trend lines. 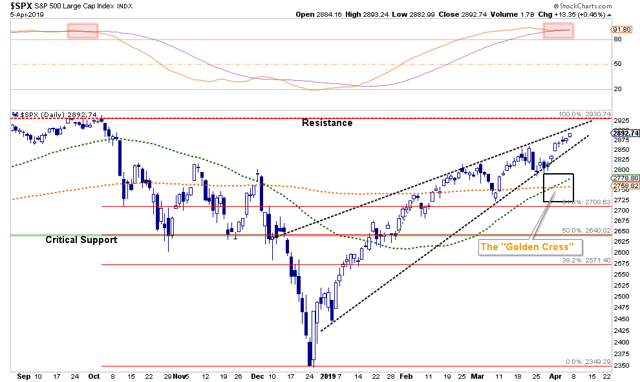 This suggests that risk outweighs reward momentarily and, since we have a decent amount of market exposure already, there is no need to go rushing into the markets at these levels. If you are overweight equities - take some profits and reduce portfolio risk on the equity side of the allocation. However, hold the bulk of your positions for now and let them run with the market. If you are underweight equities or at target - remain where you are until the market gives us a better opportunity to increase exposure to target levels. 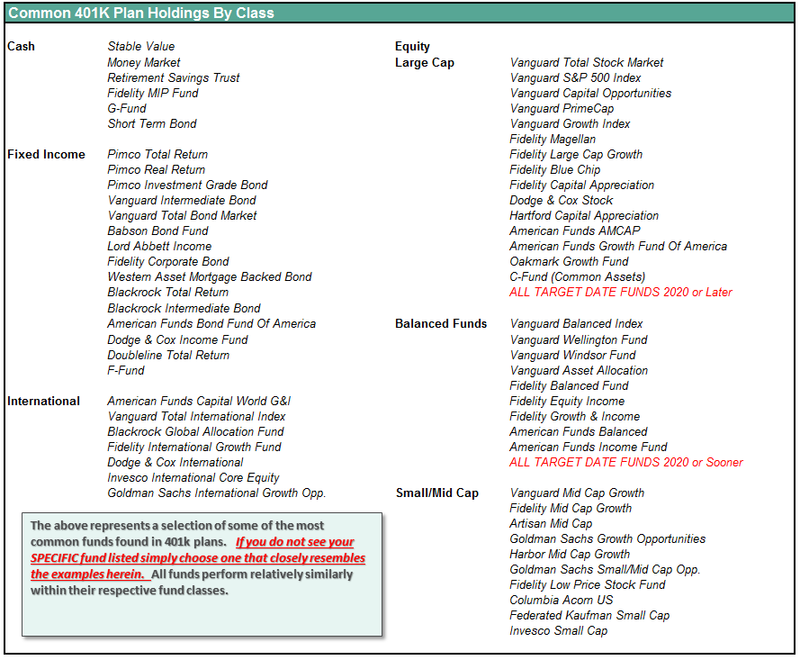 The list below shows sample 401k plan funds for each major category. In reality, the majority of funds all track their indices fairly closely. 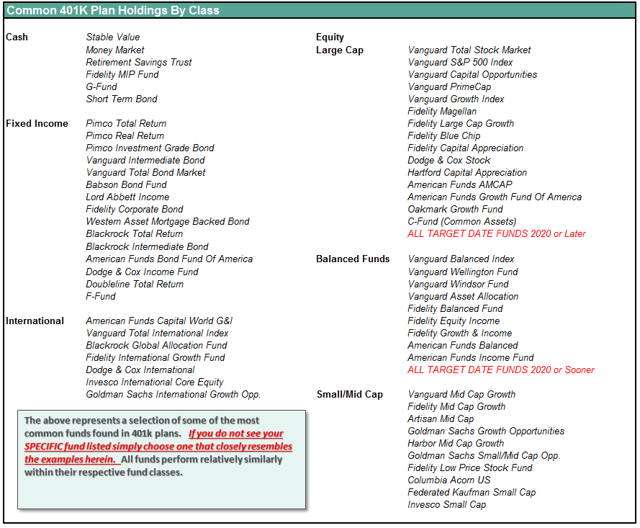 Therefore, if you don't see your exact fund listed, look for a fund that is similar in nature.